Grantown on Spey Golf Club. Grantown is the capital of Strathspey and is a small town with a history of tourism and visitors are always welcomed at the Club. This 18-hole golf course was formed in 1890 and is situated in Strathspey, approximately thirty-five miles south east of Inverness in Scotland. From a humble beginning the golf club has evolved over the years and in 1999 a major extension and refurbishment was carried out to the clubhouse to upgrade it to the very best modern standard. The clubhouse was provided with new locker rooms and an enlarged lounge bar and dining area. The golf club also has a well-stocked golf shop with a good range of all golfing equipment and clothing. The course measures 5710 yards, with a par of 70 and Standard Scratch Score of 68. Though not long, it presents a fair challenge for every standard of golfer. It is naturally split into three sections – Holes 1 to 6 are played over flat parkland, holes 7-12 are played through moderately hilly woodland, whilst holes 13 to 18 revert to undulating parkland. The ‘signature’ hole of the course is Murdie’s View, the 275 yard 9th, a short downhill par 4 with the spectacular backdrop of pine trees and the Cromdale Hills. Elsewhere on the course, magnificent views of the Cairngorm range may be observed and wildlife abounds. Officially opened by former R&A Secretary, Sir Michael Bonallack, Craggan Golf Course (Grantown’s 2nd gold course) is now an 18 hole course of 2406 medal yards. Designed by PGA Professional, Bill Mitchell, the first 9 holes were opened in 1995 and the extension was opened in 2000. This parkland course situated beside the river Spey in the Higland region of Scotland boasts magnificent views of the Cairngorm mountains to the south and the Cromdale hills to the east and is easily accessible from the A95 Speyside road one mile south of the town of Grantown on Spey. It is a par 3 course suitable for all standards of golfer, children are most welcome, and while it may not be as long as some it is an excellent test of anybody’s short game with holes ranging from 51 yard 16th to the 209 yard 11th. Our signature hole is the 12th, 162 yards downhill onto a two tiered green and over a small pond with the river Spey as a backdrop. There are few places a golfer could be happier on a sunny summers evening than here! The is also an 18 hole putting green of approximately 500 yards which is free if you have paid for use of the golf course and adjacent to the course there is a trout fishing loch and other outdoor activities. In 2003 a clubhouse was built where there is a tearoom serving meals, drinks and snacks as well as a small equipment shop selling or hiring most of a golfers needs. The clubhouse is open daily from 10am to 6pm between April and October and will be happy to satisfy your needs to the best of our ability. Established in 1893, Abernethy Golf Club is located on the B970 road between Grantown on Spey and Coylumbridge, just north of Nethybridge, 4 miles from Grantown. On most days, it is possible to “walk on”, without a reserved tee time. Families are welcome and handicap certificates are not required. For those without clubs we have a few sets for hire. 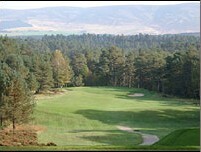 Abernethy is a traditional Highland golf course, built on natural moorland, and surrounded by majestic pine trees. The course is suitable for golfers of all standards. Casual visitors will cope perfectly well with the friendly course layout while low handicappers will need to bring their very best short game to score well. 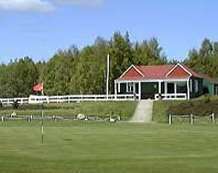 The clubhouse (unlicensed) serves snacks, home baking and refreshments. Abernethy golf course is home to many wildlife species. Red squirrels abound in the forest bordering the fairways and curlews nest between the seventh and eighth holes. Golfers may even glimpse an osprey flying over the course carrying a fish to feed its young at the famous Loch Garten nest – a rare birdie indeed. Boat of Garten Although difficult to choose from several great holes, the 6th (The Avenue) is often regarded as the course’s “signature” hole. A good drive down the narrow tree-lined dogleg fairway leaves a mid-iron approach shot to the plateau green, which is guarded by bunkers to the left and right. As on every hole at Boat of Garten, accuracy is rewarded but beware the wayward driver! “The Boat” is always wonderfully presented and has been dubbed “the Gleneagles of the North”. Ranked in Scotland’s top 40 courses in 2008, it was also voted Scotland’s No.1 Hidden Gem by readers of Bunkered magazine and is regularly featured in magazine articles. Ever popular with visitors from both home and abroad, the Course has become firmly established as a “must” for golfers, whether enjoying a golfing tour of the Highlands or just playing one or two rounds in the North of Scotland. 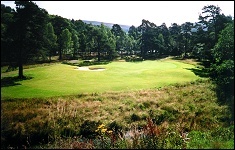 The attractive surroundings of the Cairngorm mountains, with such distinctive features as the Lairig Ghru and the northern corries of Braeriach, provide a wonderful backdrop to this unique course. The Clubhouse offers a warm and friendly welcome and a high standard of catering to the visitor. The Club’s PGA Professional, Ross Harrower, not only provides tuition but also keeps a well-stocked golf shop offering golf equipment and clothing, plus club repairs, club hire and occasionally a tip or two on how to play the course! Two tennis courts, recently refurbished and well-maintained, are available for those members and visitors looking for an alternative to golf. Scotland is renowned for golf courses and Carrbridge Golf Club (12 miles from Grantown), providing a nine-hole golf course with full facilities in the Highlands of Scotland enjoys this fame. It is a lively, vibrant, dedicated Scottish Golf Club amidst some of the most beautiful scenery you will ever wish to see. Here you can be sociable or solitary, enter Scottish Golf competitions or play your own matches, as the mood dictates, soaking up the atmosphere whilst you enjoy your game. The natural hazards present at each hole, in the form of burns, ditches, lie of the land together with the preservation of as much native flora as can be afforded, makes this at once a thought provoking and delightful course on which to play. Golf is a pursuit that enjoys no age limits, beyond the capability of holding an iron. From Junior through to Senior, member and visitor alike, this Scottish 9-hole golf course will present a challenging, exciting and healthy game for all, 7 days a week, weather and course conditions permitting and its fun. Why not take the first ‘swing’ – you will not regret it. A hearty Highland welcome awaits anyone, golfer or not, ready to visit and enjoy all that this Scottish Golf Course in the Highlands of Scotland has to offer. The new Aviemore Spey Valley Golf Course (14 miles from Grantown) is situated close to the old Dalfaber golf course, Aviemore. With a spectacular backdrop of the Cairngorm Mountains, and the relaxing sound of the flowing River Spey, the Spey Valley Highland course is a sure winner. 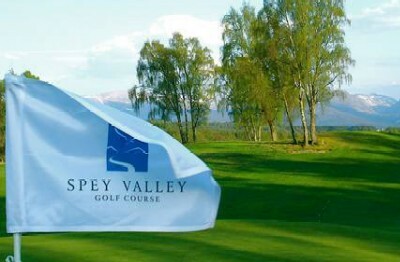 Spey Valley Golf Course is now open and is one of Scotland’s newest championship golfing venues. This 18 hole layout measures a total of almost 7200 yards and features one of the longest par 5 holes in Scotland, which, from the back tees is full 641 yards in length. The golf course was designed by renowned golf course designer Dave Thomas, who designed amongst others La Manga 3 in Spain, Seve Ballesteros Golf Club in Japan and Pria de Frade Golf Club in Brazil. PGA Professional, Fraser Cromarty (30), has been appointed General Manager of Spey Valley Golf Course with former head Green keeper of Royal Dornoch Bob Mackay as golf course manager. The Courses: The 18-hole par 72 Spey Valley Golf Course is really 4 golf courses in one. Meandering through the trees along the banks of the sparkling River Spey, it covers 7,153 yards of heathland, woodland, links and inland terrain. The signature hole is the 5th, officially the longest hole in Scotland at 635 yards (par 5), however several others deserve a mention for their natural beauty. The 6th spans a lake which has been adopted as a nesting site by a bird colony. When you reach the 12th at the start of the home stretch, the Spey Valley opens up before you like a film set, while the 16th presents a real challenge for even the most experienced golfer. You’ll need a long, accurate tee shot to carry the water hazard and the flowering purple heather awaits to punish a poor shot. However, the most spectacular of all has to be the 18th, with its two bunkers designed to mirror the undulating corries of the mountains beyond. Ballindalloch Castle Golf Course (12 miles from Grantown) This magnificent Championship standard golf course has been designed by Donald Steel and Tom Mackenzie, both internationally recognised golf course architects with courses in over fifteen countries. They have created a heady mix of challenging golf and aesthetic appeal, just as they have done at their other famous Scottish design, the Carnegie Course at Skibo Castle. With its 9 holes and 18 tees, the course provides a fair test for golfers of all standards and is well placed to become known as the finest course in Scotland with this particular configuration. The course is set on the banks of the River Avon, among 150 year old trees and with marvellous views of the surrounding purple heather-clad hills and native birch woods. Situated on the shores of the Moray Firth, the Nairn Dunbar Golf Course (25 miles from Grantown), founded in 1899, is a highly rated Scottish links championship course representing a formidable challenge with its gorse and whin lined fairways. 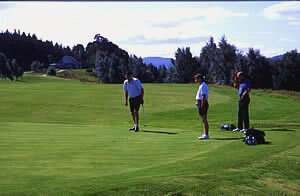 The club enjoys a growing reputation for high quality competition golf. Renowned for its excellent condition and friendly reception to visitors, it has hosted many national events such as the Northern Open Professional Championship, the Scottish Ladies Amateur Stroke Play, the Scottish Boys Stroke Play, the Scottish Amateur Stroke Play Championship, the Seniors Home Internationals, the Scottish Open Amateur Mixed Tournaments and most recently the 2007 Senior Open Amateur Championship.Sir Michael Bonallack OBE officially opened an outstanding new clubhouse in May 1998. Facilities include comfortable lounge bars, dining room, extensive locker room facilities with visitors’ room and showers.